Customers and employees demand high-quality digital experiences. Meet their expectations by deploying applications in complex, multi-platform production environments — quickly, confidently, and securely. Rocket® Aldon® solutions automate everything from the moment a business request comes in until an application is delivered to production, with full audit tracking and compliance reporting. Software development changes continually, but deployment and delivery haven’t always kept up. Rocket® Aldon® solutions automate IT workflows for delivering and deploying software — from the Service Desk to production releases. IT can respond to changes quickly and in coordination with the business, while ensuring adherence to best practices for compliance purposes. Our solutions were designed to give you a single point of control — a dashboard that provides insight into all activities backed by a database to view all your IT assets and monitor any changes to them. Think of the system as a virtual watchdog that can give you total control of your operations, automate workflows and provide a "one-stop shop" for user request tracking and seeing your IT assets. Some organizations spend 20 - 30% of their IT budget on compliance reporting and audit preparation. Rocket Aldon solutions provide automation and reporting of your software development and change processes, helping you to track, view and monitor everything necessary to satisfy ITIL, COBIT, SEI/CMMI, Sarbanes-Oxley, HIPAA, PCI, Basel II and other regulations. 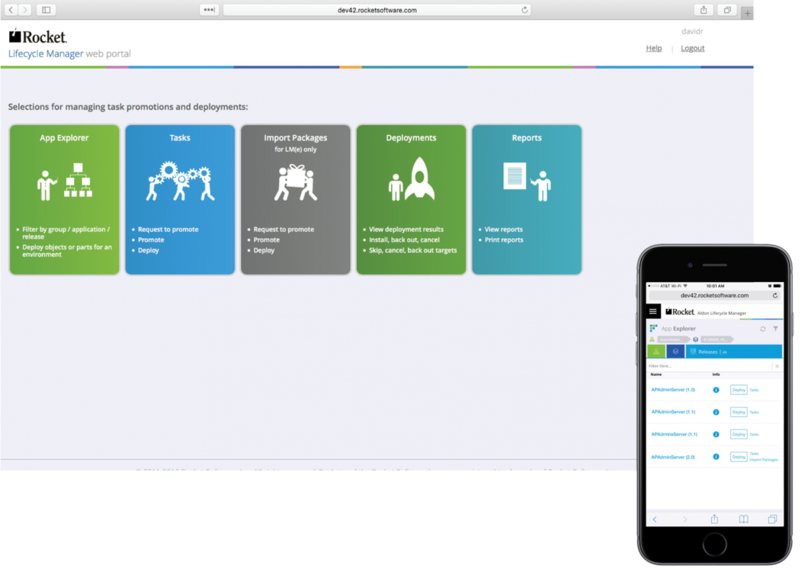 With Rocket Aldon, best practices are enforced without you having to think about it — you can even ensure separation of duties at a granular level using the Lifecycle Manager Web Portal. To help you give auditors exactly what they need, we also include special report templates designed specifically for auditors. Rather than scrambling at the last minute, you can keep your team focused on building great software. Your development teams use a variety of tools to get the job done, and Rocket Aldon solutions adapt to the way you do business, not the other way around. With support for IBM i, Microsoft® Windows®, Linux, Unix, web, and mobile development, Rocket Aldon ensures that your development teams can focus on project deliverables, continue to operate within their preferred environments, and avoid unnecessary disruptions. Aldon Lifecycle Manager’s flexible architecture supports even the most complex environments. With ongoing support of technical standards like Eclipse and SCCI, your users have the flexibility to choose the best tools for their IT needs. Aldon Lifecycle Manager also works easily with enterprise applications including Oracle® JD Edwards EnterpriseOne, JDA, Infor System 21, and Lawson and others. Aldon Lifecycle Manager even supports popular open-source tools such as Git, so your team can continue to use the tools they depend on while you embrace DevOps practices. Managing versions of code is only one part of building software. Lifecycle Manager offers release management and deployment capabilities that help you ensure that the right components make it into the right locations at all stages of your development and deployment process, so that you can assure quality and avoid outages. Our release management and deployment capabilities even fit into your DevOps processes without disrupting your team’s ability to use the version control and other tools they prefer. By freeing your developers from tedious manual processes, you can cut costs, ensure application integrity, increase efficiency, and speed up software delivery times. And by connecting and automating the entire process — build, promotion, and release — you can get reliable, dependable software into production at scale. Let’s face it — DevOps is not a “nine to five” type of job. Emergencies can and do happen at any time, and maintenance activity is normally performed when it will affect users the least. With the Lifecycle Manager Web Portal, you can track, manage, and adjust any part of the release process — anytime, anywhere. This gives your DevOps team more flexibility, helps you meet compliance requirements, and manage compliance reports on the go, ensuring key deadlines are met. The web portal fully supports devices such as tablets and smartphones, with a responsive UI that adapts to fit the device it detects. You can set up the system so that any activity generates an email that links right back into the portal, helping you stay informed and resolve deployment problems quickly, wherever you are. Identify potential concerns in your IBM i environment. Read how you can achieve more effective release management.